Are you looking to begin teaching your young child the concept of saving money? Gifted Goose Learning Inc. has an application for that, which is targeted for ages 2-4. Piggy banks come alive to eat coins and encourage children to save money in a fun way! To learn more about how to use this application with your speech-language students, continue reading! 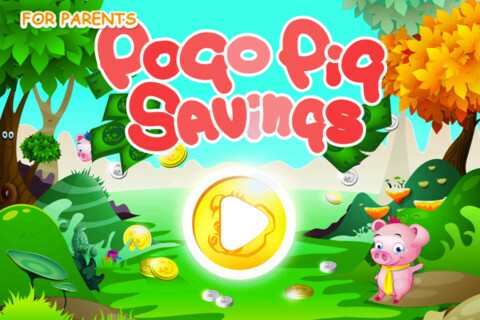 The Main Page of Pogo Pig Savings shows the title, a large coin with a play button in the center, and the text "For Parents". Pressing this text brings you to a letter about early savings. It even has a link to a Duke University study about financial success and self control in children. In addition, you can visit Gifted Goose's website or subscribe with your e-mail. Press the large coin with the triangle in the middle to begin application play. Then, choose between three pigs: one with silver coins, one with gold coins, and one with dollar bills. No matter which pig you choose, the user will be able to press, hold, and drag items from a set of six to a pig. There will be three coins/bills and three sweets or toys shown to drag to the pig. If the child drags the coins/bills to the pig, he will smile and say "Yippee"! The coin will then disappear and the pig will animate as if it is eating the coin. If a sweet or toy is dragged to the pig, he will not accept it and make a grossed out face while saying "Bleeeeh". 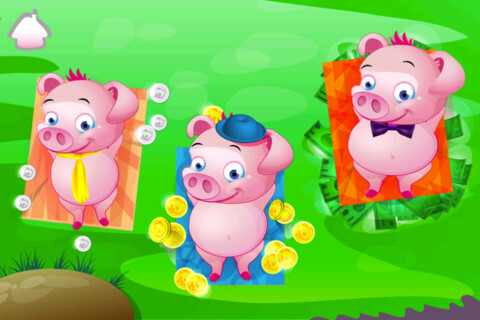 Once three coins/bills have been dragged to the pig, an Achievement Board will appear for the child to choose a prize out of a field of five. The prize chosen can be dragged on the screen to be placed like a sticker on the board. 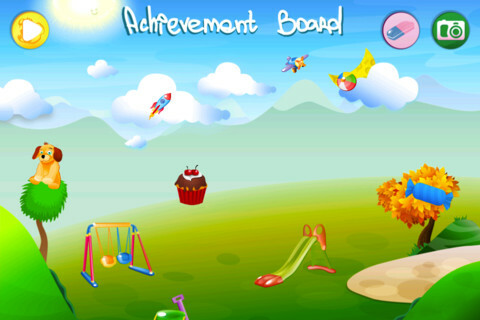 You can erase an entire achievement board to start over by pressing the eraser button. Press the coin play button to continue application play. Finally, you can take a picture of the Achievement Board to send to Twitter, E-mail, or Facebook. You must have your accounts linked to do so. The application is easy to navigate, even for young children 2-3 years old. The graphics are phemomenal, especially the facial expressions of the pigs. Children can gain a very basic knowledge that piggy banks are for saving money. I would love more settings in the application such as the ability to turn on/off the background music, the ability to turn off sound, the ability to choose how the pig reacts, the ability to remove stickers one by one, the ability to move the stickers around after they have been placed, etc. It would be great for children who are 3-5 years old to be able to be able to save up coins/bills and have a "monetary/point" value added to the prizes so that they learn about saving up for items they would like. In addition, maybe the prizes could be a variety of things - items to use in a mini-game, animated, stickers to place on the achievement board of their choice to make a scene, etc. I feel that children ages 3-4 may get more out of the application as well as have more understanding of and be more motivated to learn the concept of value. To be honest, I feel that the silly animations of the pig sticking out his tongue with disgust encourage children to want to see those animations more. I have found that my students, in a different application, have fed monsters different gross foods rather than healthy ones to get the monster to react and spit out the food. There might be a better way to have the pig reject the junk food/toys. I am not sure why one would want to share an achievement board to Facebook or Twitter, or that it is even allowed to have an account for anyone under the age of 13. I would appreciate that an application for kids would not encourage them to link to Facebook and that these links would be removed for privacy reasons. I have recommended this for other apps in the past as well. Vocabulary - Talk about monetary value, saving up for different items, the names of the different items that are prizes, etc. Life Skills - Talk about saving money, monetary value, how to pay for an item, where to buy certain items, how to earn money, etc. Pragmatic Language - Have students discuss what they are saving up for and why. Reward - Each time a child completes a task or at the end of a session, you can let the child play this application and earn more stickers for his or her achievement board. Pogo Pig Savings is available for the iPod Touch, iPhone, iPad, and iPad mini for $0.99.